One of the many reasons behind the free online fax’s incredible popularity is that this technology can be harnessed immediately once you sign up. There is no delay, so you can look forward to start sending and receiving faxes online immediately. 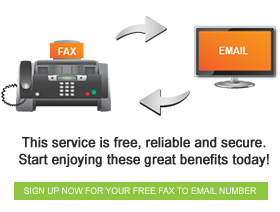 Simply sign up for your free fax to email account, and you are ready to go. What’s more, there is no limit to the number of accounts that you can sign up for. This means that regardless of the size or scope of your office, each employee can have their own dedicated fax to email account. This will help you in your endeavour to turn your office into a paperless environment, while also saving a lot of money in the process. The free online fax technology allows you to take your fax with you, wherever you go. It used to be in the past that you had to be physically present with your fax machine to send and receive faxes from your number. This is luckily no longer the case. Now you can send and receive faxes on the road, in the air or on the water. All you need is access to an internet enabled device, and you are set. Even if you move premises, or relocate to a new city or country, you don’t have to change your fax number. This means you can keep your fax number for life! These are only a few of the many reasons why it pays to register for a free online fax account today.